IJS Publishing Group has partnered with Editage to provide full range of editing, translation, and publishing services to help authors maximize quality, visibility, use, and understanding of their research. Editage, a global leader in academic communications solutions, helps scholars prepare their manuscripts for publication with end-to-end author services. Get access to highly qualified and experienced publication experts who will provide subject-relevant editing, translation, and review support. A range of pre-submission manuscript preparation services helps you create well-written manuscripts that adhere to journal guidelines and boosts your chances of getting published. We offer three levels of editing – advanced, premium, premium plus – to address the broad academic writing and publishing needs of research authors, especially for those for whom English is their second language. Choose the service you with the confidence that your paper will never be rejected on the grounds of poor language or formatting. Get fast and accurate translation from your native language to flawless scientific English. Our professional, experienced translators are committed to excellence and equipped to handle the most challenging multi-disciplinary translation projects. We know how vital it is to use accurate industry-specific terminology to convey the author’s intended meaning. We specialise in complex, scientific and academic translations performed by handpicked teams of expert translators with extensive experience. All reputable journals scrutinize articles for plagiarized content. Plagiarism, intentional or otherwise, is an ethical violation, and leads to the paper being rejected for publication. It can also have a detrimental effect on the author’s reputation and credibility. Editage’s Plagiarism Check services helps to identify areas in your manuscript that might be flagged as plagiarism. We use sophisticated plagiarism software to scan and check the originality of your content, and provide you a report that highlights trouble areas. Your graphs, photographs, illustrations, diagrams and other visuals go a long way in communicating your research findings. Our artwork editors are skilled at perfecting images in terms of resolution, size, manuscript color and so on, to meet the most complex and stringent journal requirements. Our graphic design specialists understand technical artwork guidelines across a variety of journal and can create complex figures with great accuracy and aesthetic value. Experienced in working with a range of file formats, they use the most modern software to meet all your artwork requirements, both at the time of submission and after your paper has been accepted. Did you know that four out of five manuscripts are rejected by most scientific journals? A rapid technical review gives you an expert panel of published authors. They know what goes into an effective peer-review process and will provide constructive comments to improve your manuscript before submission to the journal of your choice. This assessment process closely resembles the peer review process of major high-impact journals and will improve your chances of receiving favourable comments from the journal editorial team. Eliminate most major reasons for manuscript rejection and get comprehensive, actionable comments within a rapid turnaround time, allowing you to revise your manuscript and still meet aggressive publication deadlines. Be it the latest discoveries at your university or the best research published in your journal, Editage Research Communication Services help you communicate research to a broad audience using engaging text, graphical, and audio-visual formats. Our team of research communicators create multimedia content that can be published as supplemental digital content along with the article or can be used to build a multimedia gallery for already published articles. Contact us and briefly explain the reasons for your dissatisfaction. We will respond to you after assessing your feedback. Post-editing supportOur editorial process also enables you to communicate with your editor after you have received the edited file, to get your questions answered, discuss editorial changes, or request for another round of editing for a revised manuscript. Log in to your EditageOnlineTM account and upload your revised manuscript. Write to us at request@editage.com with your job code and mention that you want re-editing support. We guarantee that all editing assignments will be delivered at the date and time stipulated at the time of assignment confirmation. We will waive the full fee for any editing assignment that is delayed due to an error on our part. You have received an email notification confirming job delivery in your registered email account. You have received the edited files as an attachment by email, or the job delivery notification along with FTP details (in the case of large files). What background and specializations do your editors have? We believe there is no substitute for subject-matter expertise. That is why we ensure that every document we receive is worked on by an expert with a high level of technical competency in the relevant field of study. Our editorial team includes physicians, PhDs, MDs, postgraduates, engineers, and journal peer reviewers. Over 60% of our editors have extensive research backgrounds. In addition, our editors are provided with training and feedback on a regular basis to help them develop a keen understanding of subject-specific writing conventions, terminology, etc. We provide manuscript editing services to meet the publication standards of international high-impact-factor journals. We offer 3 levels of manuscript editing and proofreading services for academic research papers. 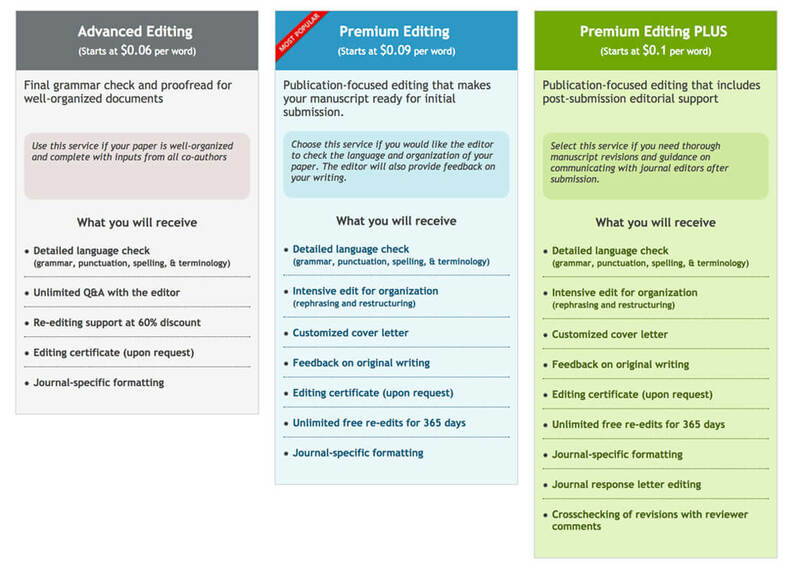 Select an editing service to take your first step toward publication success – Advanced, Premium, or Premium PLUS. Each service differs on the basis of the level of editing detail. What is the difference between Advanced Editing, Premium Editing and Premium Editing PLUS services? These 3 services review the various areas of your document in different levels of detail — quality of language, general formatting, content and consistency in language style. Premium Editing PLUS includes all features of premium editing and it also helps in strengthening your responses to journal reviewers’ comments with the help of a subject matter expert, and you will get all queries addressed and manuscript revised until it is ready for publication. Use the Order Now button to review the available plans (levels of editing and delivery dates). If you’re still unsure of which plan will suit your document and your needs, you can contact us for a customized delivery date and quote, by clicking here. Our Client Servicing team will review your needs and your budget and accordingly recommend the most suitable plan for you. How is the word count of my manuscript calculated? When determining the word count of any document, we consider the entire text, including tables, references, and mathematical formulae. However, if you would like us to exclude certain sections of the document, the word count of those sections will not be considered. Please note that any files attached for reference are not considered in the word count. A request for a change in the type of editing service will be accommodated if we have not yet begun work on your document. Please contact us if you would like to change the type of editing service. Do you edit documents in PDF file format? Yes, we do. We indicate our changes in the PDF file by using a PDF editing software that allows authors to identify the changes in the document. Editing for PDF documents costs 15% more than the normal service fees. Do you edit documents in LaTeX and TeX formats? Yes, we deliver the final edited document as a TeX file. Accompanying the edited LaTeX document is a Word document that shows the changes we have made to the text and includes comments and suggestions by the editor. Please note that we do not accept LyX files for editing. The fee for editing a TeX document is 15% more than the normal editing fee. Will you format my manuscript according to the journal’s instructions for authors? Yes, we do format documents for journal submissions. Request formatting when submitting your inquiry on the online account and include the URL of the journal you are submitting your article to so that our editors can make sure that your submission fulfills all the journal’s formatting requirements. What if I need my document delivered on an urgent basis? If you need your document edited on an urgent basis, please email us and let us know by when you would like us to complete work on your assignment. We will do our best to meet your deadline. I need an editing certificate. Will you provide me with one? Yes, you can access your editing certificate from your account in the online account. The editing certificate verifies that your manuscript has been checked by a professional editor and meets the standard of English required by international journals. If I have questions about the edited document, how do I ask the editor? By when will you get back to me? If you have a question for your editor, you can login to the online account and use the Submit Question option. We normally answer within 1 working day. However, a member of our client servicing team will confirm the delivery schedule with you as it is determined by the nature and number of questions. If you have made significant changes to your paper after we have edited it (e.g., you have introduced new content or rejected our changes), the Quality Guarantee may not be fully applicable. If you are unsure about whether you can use the Quality Guarantee, email us and we will check the document and provide you with an accurate assessment. How do I use the online account? Once you have submitted your first editing job to us, you will be given a User ID and Password to access the online account. You can maintain all details of your account with us through this system. The system has the following features: Submit job, Check job status, Price and Delivery check, Download edited paper(s), Payment section for credit cards, Bank transfer confirmation, Download invoice, and Personal information. If you have forgotten your password, please click on the “Forgot username/password” link. You will be asked to enter your login email ID and your password will be sent to that email ID. In case you have forgotten your login email ID, please contact our client servicing team and they will get back to you as soon as possible. Founded in 2002, Editage (a division of Cactus Communications) is a global scholarly communications company with offices in Japan, China, South Korea, India, United Kingdom, Singapore, and the United States. Employing a global in-house workforce of over 750, Editage has served over 235,000 authors and edited over 900,000 papers across 1,200 disciplines to date. Editage aims to help scholars break through the confines of geography and language, bridge the gap between authors and peer-reviewed journals, and accelerate the process of publishing high-quality research. In addition to offering high-end scientific communication solutions, Editage is actively involved in author education through its comprehensive author resources site Editage Insights. Please visit www.editage.com to learn more.